This covers low blood sugar (hypoglycemia), very high blood sugar (diabetic ketoacidosis) and what to do if you are left without your diabetes medication and/or supplies. What counts as a diabetic emergency? It can be a difficult area sometimes to know what counts as a genuine emergency. News reports in recent years have highlighted that a significant number of ‘999’ ambulance call-outs have not been necessary - for example to treat mild hypoglycemia which, in some cases, has been successfully treated befor e the ambulance has arrived. This isn’t to say that conditions, such as hypoglycemia, are not dangerous but that it’s important to know when a situation really is an emergency so that an ambulance is not unnecessarily called. An ambulance will be needed if someone has either very high or very low blood sugar levels that presents an immediate danger and neither they nor anyone around is confidently able to treat them. Ketoacidosis and Hyperosmolar Hyperglycemic Nonketotic Syndrome are both life threatening conditions. Hypoglycemia can also be life threatening in some cases. Someone with diabetes that is unconscious is one of the situations in which you should call for an ambulance. If you have doubts about whether the situation is serious enough to warrant an ambulance, call 111. Hypoglycemia can become dangerous if it is not treated quickly, particularly if it is a result of an insulin overdose. Hypoglycemia can often be treated at home but if someone is unable to take sugar or does not show signs of improvement after taking sugar, other options will be needed such as a glucagon injection or an ambulance. If you have glucagon, check it is in date, and follow the instructions in the glucagon kit carefully. If you are unsure about using the kit, and nobody is present who is, call for an ambulance. To prevent hypoglycemia developing into a more serious situation, make sure you have hypo treatments, such as the HypoWallet, to hand. In most cases, non-severe hypoglycemia can be treated by taking glucose followed by slower acting carbohydrate such as bread or fruit. To prevent hypoglycemia developing into a more serious situation, make sure you have hypo treatments available at all times. Having a HypoWallet is a useful way to ensure you’re well prepared for hypos. The symptoms include vomiting and a laboured form of breathing known as kussmaul breathing, which may be identified by gasping breaths. If someone is going through DKA, it is often possible to detect ketones on the breath, which can be similar to a fruity smell or similar to nail polish. 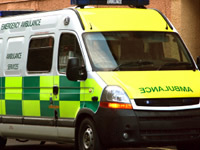 If diabetic ketoacidosis is suspected and the person is either incoherent or unable to help him or herself, call 999. HHNS is a short term complication that can occur in people with non-insulin dependent diabetes, such as type 2 diabetes, if blood glucose levels rise to a very high level of 30 mmol/l or above. If someone is showing the signs of HHNS it is important they receive emergency treatment. If the person is unconscious or unable to sit or stand, put them into the recovery position. Try to stay with the person in case their situation should get worse. If an emergency situation is developing, it’s important the people around you know that you have diabetes to help them to be able to help you. Wearing emergency identification will help people, including paramedics, to recognise that you have diabetes should you need emergency care. You should ensure you have sufficient supplies, including spares, wherever possible but there can be times when you may need emergency medication or supplies. If you need medication and supplies right away you will need to get an emergency prescription. If your surgery/medical centre is open, your GP should be able to write out a prescription. You will need to get to take the prescription to either a pharmacy that has the medication (such as insulin) or supplies or it may be possible to get the medication/supplies from a hospital. If you are away from home, contact NHS 111. To minimise the chance of a serious emergency at work, school or university, it’s best to ensure the people around you are aware you have diabetes, what dangers could potential happen and how to deal with any such situation should it develop. Particularly at work, some people may be worried about disclosing their diabetes to their employer. In terms of health, it’s best to do so. To have the best chance of dealing with diabetes emergencies on holiday, make sure the person with diabetes has travel insurance which includes cover for diabetes as a long term illness. It helps to be prepared. Ask your travel agent for advice on emergency medical care in your destination or resort. It may be advisable to research how to pronounce key words and phrases related to diabetes in the country you will be travelling to. If you do have to use another language to communicate, keep it as simple as possible, unless you are fluent yourself.